The search for the UK’s freshest squid squad returns for 2018 in the search to find the UK and Ireland representative for the Splatoon 2 European Championship’s 2018-2019 season! 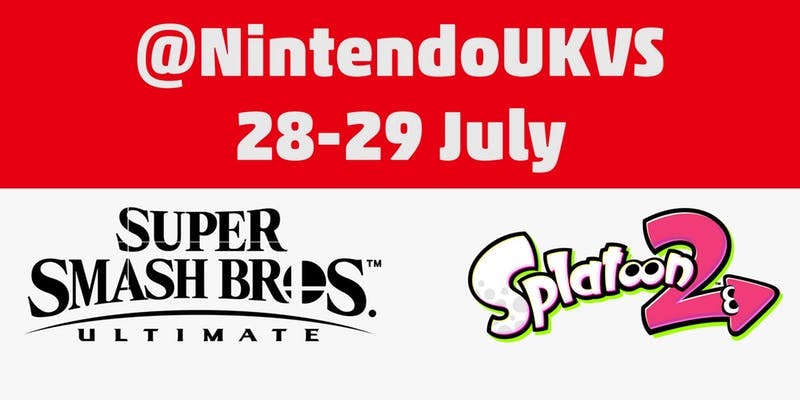 Brand new event, @NintendoUKVS Live: London is taking place 28-29 July offering the first official qualifier for the Splatoon 2 UK Championship 2018 as well as first ever opportunity to play Super Smash Bros. Ultimate for Nintendo Switch in the UK! 21st June, 2018 – Mark your calendars, Nintendo UK is kickstarting the rest of its 2018 event schedule with @NintendoUKVS Live: London, taking place 28-29 July 2018 at the Royal Horticultural Halls, London. The @NintendoUKVS Live: London event will cater for the hardened competitors seeking fame and glory in intense tournaments, to more relaxed gamers eager to chill-out with like-minded fans and go hands-on with the latest games for Nintendo Switch. @NintendoUKVS Live: London will provide social competitive entertainment for players of all skill levels and abilities and will play host to the first official qualifier for the Splatoon 2 UK Championship 2018 series, as well as being the first ever event in UK & Ireland to get hands on play with the highly anticipated Super Smash Bros. Ultimate exclusively for Nintendo Switch. New for this 2018 UK series will be the introduction of the Octo League and Inkling League. Octo League matches will be played in ranked game types in best of five matches, this league is open to teams of all ages. The Inkling League is a new division specifically for squads of younger players aged 13 and under, with matches played as Best of Three in the Turf War game type. Between this @NintendoUKVS Live: London event and the others listed below, 7 Octo League teams and 4 Inkling League teams will be found to take part in a UK grand final being held at a @NintendoUKVS Live event in Birmingham in November 2018, where the top squads in both age divisions will be crowned as the Splatoon 2 UK Champions 2018. Be sure to tune in at Twitch.tv/NintendoUK, where Nintendo UK we will be livestreaming footage from all qualifier events. The winners of the Octo League will then go on to represent the UK & Ireland and compete in the Splatoon 2 European Championship’s 2018-2019 season+, culminating in a live grand final in spring 2019. The @NintendoVSUK Live: London event, on top of being the first official qualifier for the Splatoon 2 UK Championship 2018 on Saturday 28 July, will be the first ever event in the UK to go hands-on with the upcoming Super Smash Bros. Ultimate for Nintendo Switch. The game will be playable on both days, with a headline tournament running on Sunday 29 July 2018. As well as these headline events, multiplayer favourites like Mario Tennis Aces, ARMS, Pokkén Tournament DX and Mario Kart 8 Deluxe will be available to play alongside other upcoming titles for free play all weekend – stay tuned for more announcements around other games which will be playable! There will also be an exciting stage show schedule to watch and take part in at the event, including the brand new @NintendoUKVS Game Show which made its debut at MCM. Tickets for the public to attend the @NintendoVSUK Live: London are available now and are distributed purely on a first come, first serve basis by visiting this Eventbrite page. For those that can’t make it to the event, fear not! We will be livestreaming both days of the show, bringing to you the action from the headline tournaments, as well as interviews with top players, and general coverage from the @NintendoUKVS Live: London event. Make sure to tune in at Twitch.tv/NintendoUK, and follow @NintendoUKVS on Twitter, to keep up to date with all the Nintendo social competitive updates from the UK & Ireland. For more information on @NintendoUKVS event and other events Nintendo will be partaking in within 2018. Categorised in: News, Nintendo, Nintendo Switch, Splatoon 2, Super Smash Bros Ultimate, Super Smash Bros.